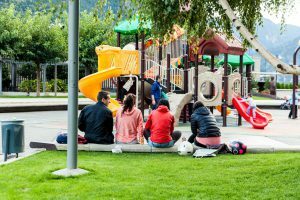 If you have ever visited this blog before, it won’t surprise you that “Playing together” is my number 1 tip for moms and dads who want to spend quality time with their kids. At the end of the day, having a blast with your kid is all about rediscovering your inner child. Fear not, I’m not going to get into any kind of psychology here. What I’m trying to say is this: If you really want to bond with your child and have a good time together, try to follow them into their “world”. Try to enjoy what they enjoy and share the fun. If it is hard for you to enjoy playing with the “kids toys” your son and daughter enjoys the most, here is a word of advice: Don’t feel bad. Benni also has a few toys that I don’t like. But it is OKAY to be a bit selfish here! Huh, that comes as a surprise, right? How can a mom or dad be selfish? Let me explain! If you want to play with your kid, you may safely assume that he or she wants to play together with YOU as well. And if you don’t enjoy their toys, they will notice that and it won’t be as much fun as if you share the excitement of playing with a toy that both of you love. 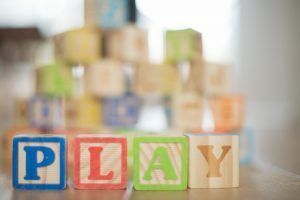 So when you join your kid for a mutual play session, why not tell him (or kindly ask) to put away that puzzle you do not enjoy that much and play some Lego or Duplo with you instead, if YOU enjoy that more? Your kid will most likely agree, because having quality time with YOU by playing together is usually much more important than holding on to this one toy he or she is playing with right now. And if you are really excited to play with the toy you are suggesting, it will carry over and your kid will be excited as well! If you are looking for some inspiration what toys you may want to get that qualify as “interesting for kids and parents alike” then take a look ad my List of Top 10 Toys For 3-Year Olds And Their Dads (works for moms as well, I bet 🙂 ). 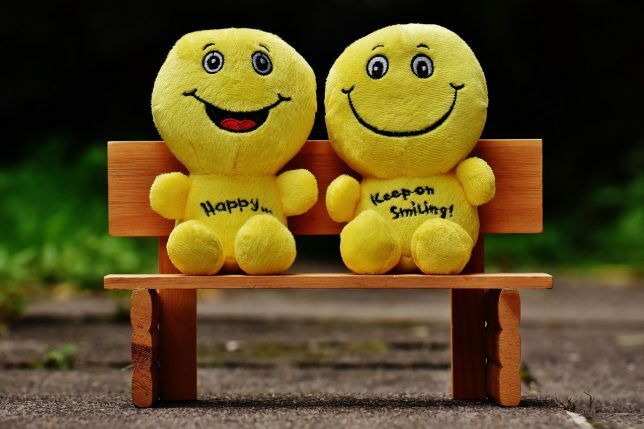 Now, if toys aren’t your thing or you are simply exhausted froma hard day at work then this second tip may work for you almost as good as the first one. Read out stories! Reading out a book can be very entertaining for the two of you and can bring together the entire family. Sometimes I am just not in the mood of getting down on the floor and actively playing, or Benni is tired. 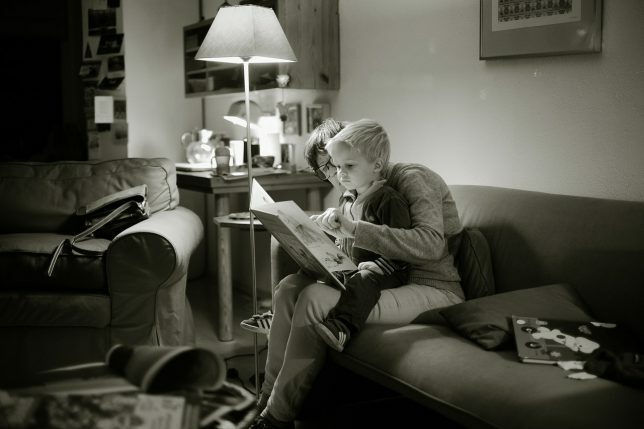 What we would do in that scenario find a cozy spot somewhere in the house and read out a story. You have several options here and you will have to figure out which one works best for you. Not all parents are the same, and your kids aren’t either. So just give it a try. The first option would be to pick up a storybook. When we do that, Benni would usually sit down on my lap or right next to me and we go through the story and talk about what we are seeing. Sometimes, when it’s a story that Benni already knows, he starts “reading” the story to me, which is quite fun. Something you may also take into consideration is reading the book with the entire family. Imagine sitting there with your kids and your wife, and everyone is acting as one of the characters and reads the lines of that particular character with their voice!? This type of playing it out isn’t for everyone, but it is certainly the option that brings the most excitement to the table. I know there are days when I am even too tired for reading myself. It rarely happens, but it sometimes does. In that case sitting down together and enjoying a really old school’ish session of listening to “old school” radio plays can turn out as very well spent quality time as well! There are tons out there and if you just want to give it a try before investing into it, you may just want to check out Amazon’s Prime Music library, as they sometimes feature very well-made radio plays as well. 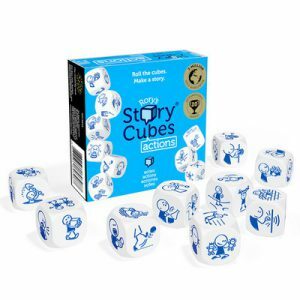 Finally, there is one last options for the advanced story readers of you: Story cubes. Now, this may or may not be well suited for you because it requires a lot of fantasy and you will have to actively work out a story. Here is how it goes: Story cubes are small set of cubes (usually sold in sets of three) that have different pictures on either side. Now you through these cubes and you make up a story from what they show: For example one cube shows a sorcerer, the second a castle and the third one a butterfly. Now it’s your job to make something out of that 🙂 If your kid is already a bit older, you can also turn this game into a game of building out that story together or challenge each other or the like. The possibilities are endless. or even taking your kid to the hardware store. I know, that “hardware store” point may sound a bit weird at first, but hear me out: When I want to spend quality time with my kid, it is, in my opinion, important that you share the things with your child that you are passionate about. If you have to something in the backyard or in the house this weekend and need to get some stuff in preparation, why not take your son or daughter with you when buying it. Usually kids are very interested in the stuff you as their parents are interested in or better yet excited about. Share these things with them! Of course, as mentioned above, this point also includes more traditional activities like going to the park or visiting the playground. If possible, combine such a “getaway” with something you don’t do every day. Maybe take the bike together with your kid (make sure that you have a good safety seat or kids trailer and wear helmets, though) or even public transportation. That’s interesting for kids and if it’s something you don’t use every day, it may get you excited as well (which, again, is key here)! I try to share the things I am excited about whenever I can with Benni. I go swimming with him, we go to the model airfield or to the Nürburgring racing track every now and them. Obviously, there isn’t much for him to do; but lots of things to experience and get interested in. Maybe you are a private pilot or love driving the motor cycle. Maybe you love go fishing or see the Yankees play. If there aren’t overwhelmingly complex security measures required (and it doesn’t get dangerous for your kid, never put their health at risk), try to share that with them. They will thank you later! This one may come as surprise, and I do not want to go too deep into this, as I have already dedicated an entire block post to this topic. I just want to say so much here that I was a huge fan of video games my entire life, and I guess I will always be. And that’s a good thing! It’s something I enjoy and it is part of who I am. I strongly believe that I can leverage that to give my son the best starting position when it comes down to developing a healthy relationship with multi media some day. In this rapidly changing world computers already play a big role, this process will not be turned over. Computers will only get more important. And just like with physical toys, my basic idea holds true: The best way to learn is through play. Benni will get in touch with video games sooner or later (rather sooner) with or without me and it is in my and Bennis best interest when I help him developing a healthy relationship to them right from the get go. In our case that means that we are having a blast together when we fire up my PC or Nintendo Switch. Yes, we spend quality time together! However, time in the virtual world should under no circumstances exceed the amount of time you spend together in the “real world”. That’s important: Anything you overdo can turn into poison, and that is true here as well. So be creative! Play the games that you enjoyed as a kid. Play hide-and-seek in your backyard or inside the house, play tricks at each other. Even “fight” a bit for fun. Why not? As long as your kid understands that there is a time and a place for everything, you’ll be fine, and you’re being a great parent! Now, this is the secret sauce to spice things up: Understanding that spending quality time together does not necessarily mean that YOU as moms or dads have to keep your kids and yourselves entertained every single minute! You’re a parent, you’re a super hero ALREADY! Allow yourself and your kid to be by himself as well, while still letting that time count towards quality time. If I notice that Benni is fiddling around with a toy all by himself, I don’t disturb him. I find something to do by myself. Like drinking a cup of coffee. Or preparing a blog post. Or reading the news. The key is not to park your kid in front of a toy, but to also understand that it is okay that your kid (and you) need some time for yourselves every now and then. Just be there for each other when you need each other! There you have my 5 tips, or better yet top-level ideas, on how to spend quality time with your kid. I hope my article had something in it for you and that you could get some inspiration from it. If you have something to add to the story, or there is something you disagree on, please do not hesitate to reach out. There is a comment section below where I read and respond to every single comment. You can, however, also reach out via email, of your story is more personal and you want to talk in private. My email address is chris@ThatToyDad.com. If you want to dig a bit deeper, you are more than welcome to read either my article Top 10 Toys For 3 Year Olds And Their Dads, my review of the Hubelino Marble Run System (which is an amazing toy to get started with my tip #1 from above) or my essay about The Best Video Games For Kids And Their Dads To Enjoy Together. I don’t have kids but definitely this guide is very useful. I’ll need it in the future :). What do you think about video games and technology in general for kids? Because I remember when I was Young and I played a lot with Game Boy and Play Station, but I wish I could read more in those days. Thank you for taking the time to comment! Regarding your question, I believe that is inevitable for kids nowadays that they will get in touch with tech and video games sooner or later. They need to learn how to deal with computers anyways. Why not learn it sooner than later and have fun doing so? 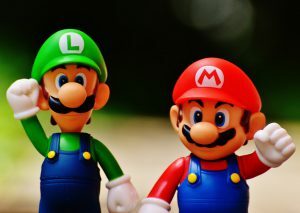 I love playing video games with my son; and I’ve actually dedicated a whole blog post to that topic 🙂 Make sure to check it out! Nice advice. I do not have kids yet, but someday I will. I will use your advice when I get the opportunity. I can imagine it’s not always easy to “return” to the world of being a kid with your kid. I put my Jurassic Park dinosaur toys in a bin about 20 years ago and haven’t played with them since. Hopefully, my kid will enjoy them when I get to that point in my life. Hey Todd and thanks a lot for your comment. Glad you liked my article! Maybe you know someone who has kids right now and might like my blog!? It would be great if you could share it with them 🙂 Oh, and make sure to take these dinosaur’s out every now and then? Maybe you can put them in a showcase or so and show them off as collectibles? Sounds like you had a blast with them as a kid! Don’t let that memory slip! Hi Chris, Thank you for this great post. I am a granny and absolutely love spending time with my grandchildren. When my two grandsons and their parents came to live with us for a while, I found that they were of an age to enjoy board games but the most fun we had was building a pond and river in the garden. They were so interested and helped a great deal. Although they are bigger now they still talk about it and the fun they had. Now with my four year old grandson we play in the monkey tree. He says, its a pity I am not a kid otherwise I would be his best friend and we could have picnics in the monkey tree. Love spending this quality time with my Ben. His parents also have great fun with him. thank you so much for this lovely comment! Sorry that I didn’t manage to reply earlier, I guess your comment somehow slipped through. I wish you and your grandkids all the best! Enjoy your time together, it sounds like your amazing grandparents! Oh my goodness, Chris, how you took me back down memory lane with your suggestions. As you mention, for a parent it can be difficult to start spending quality time, hence fun time with your child, especially after being at work for the whole day. But, if I can add to your valuable suggestions, stop for a moment and think how quickly time passed already since your child was born. Well, believe me if I tell you that, before you know it, your son will be 18 – an adult! – and those precious moments will be gone forever, only to be stored in your heart for life. All of what you suggested brought the greatest joy to me, and I like to think to my son too. There is nothing better in life than being able to share in the fun time with your child. They are our children, they deserve more than child minding. Thank you ever so much for your ideas, Chris. I happen to think they are absolutely brilliant. what a beautiful comment, and so true! Thank you so much for taking the time and sharing your thoughts with me! I totally agree. Benni is just 3 years old (almost) and when I look at the pictures that were taken just 2 and a half years ago, it feels like pictures from a different era. I was not aware about “Story Cubs”, but it seems interesting. Do you have any tips for a 9 years old. Hey, Chris, this is a very interesting story.I better say story, because every paragraph I read I feel like I am watching a movie.Thank you for sharing these valuable tips with us.I will share it with my elder sister she has got two babies Hosanna, she is 4 and Hosea, he is 18 months old. thank you for the compliment. Glad you liked my writing style. Looking forward to your sister visiting my blog. Please ask her to reach out if she has any questions. Maybe this blog is something she also wants to share with her husband!? This is amazing! Very informative and helpful! Yes, kids actually spell Love with “T.I.M.E”, and I agree, they want that quality time with their parents haha. Thank you for sharing! I have to write that down. Spelling love with “T.I.M.E.” is a strong statement! Love it!!! Is that a common theme in the US? I’m from Germany and I’ve never heard it before, not even from close friends. How cool! When I used to pick my daughter up from school she used to find it highly amusing that I sang along (completely tone death by the way) and made myself look like a complete idiot by dad dancing (only when stationary). I found that even when we weren’t doing anything that day it generally put her in a good mood. Now she is sixteen and while she has her moments when she isn’t worrying about something or someone there are still times that she expects me to do it and we both have a good laugh. thanks for sharing this 🙂 What a fun way to connect with your kid; and even more impressive that it still works today. As parents, we build a really deep and important relationship with our kids. Playing and having fun together are really key here! Your case proves that yet again. 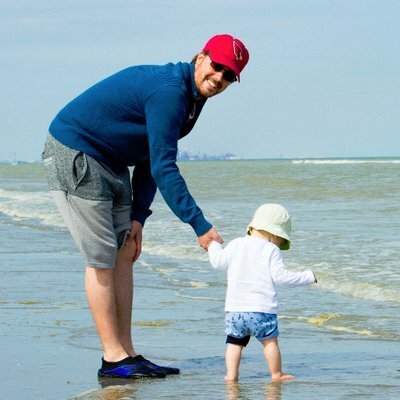 Very insightful post as I feel this a problem many parents face. I think being creative is a key part as although reading books and playing together are very important, they can become a bit repetitive when done constantly. My daughter’s favorite thing to do is read her Lion King book. She doesn’t know how to read just yet, but she mumbles gibberish when she has the book in her hands. She copies the way I read it to her. She can tell by the picture when a character is talking and emphasizes more on her words. Thank you for this great article and for giving some great ideas!